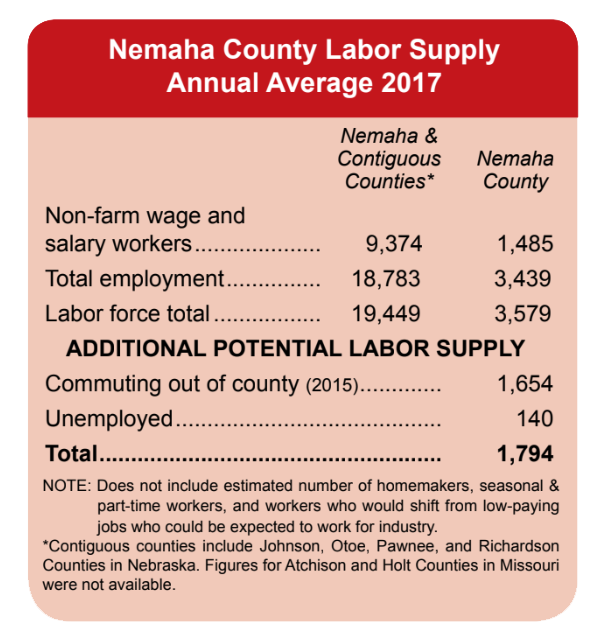 The Nebraska Department of Labor serves employers and job seekers across Nebraska through its “One-Stop Career Centers” located across the state. Services for employers include employee recruitment and screening, posting job openings, tax credit information, and labor market and labor law information. Jobseekers can find a full array of employment and training related services including on-site services provided by a network of mandatory Workforce Investment Act partners. The nearest One-Stop Career Center is located in Nebraska City, 20 miles north of Auburn. To learn more about these and other services visit neworks.nebraska.gov. Nebraska has a right to work provision in its constitution. In 2012, 6.0 percent of Nebraska’s wage and salary workers were members of labor unions compared to a national figure of 11.3 percent. Local industries estimate fringe benefits to range from 27 to 40 percent of wages.